Since the dawn of humanity, we’ve been fascinated with time. For our Neolithic ancestors who built Stonehenge by carrying 30 ton monoliths for hundreds of miles and assembling them in a semi-circle, it was actually a matter of life and death. Having the ability to tell with infinite precision the time of both summer and winter solstices gave them an indication of when best to plant crops and therefore eat and survive. Although intangible and meaning different things too many people and cultures, we can all agree on one thing regarding time: it’s crucial. Therefore it’s no surprise this significance needed to be reflected in the value of the object that was used to tell time. From ancient Egyptian sundials, to the Rajput’s in Rajasthan who associated precious gems with specific periods of the day, all the way to the intricate time pieces of today, there’s been huge amounts of desirability associated with these objects. 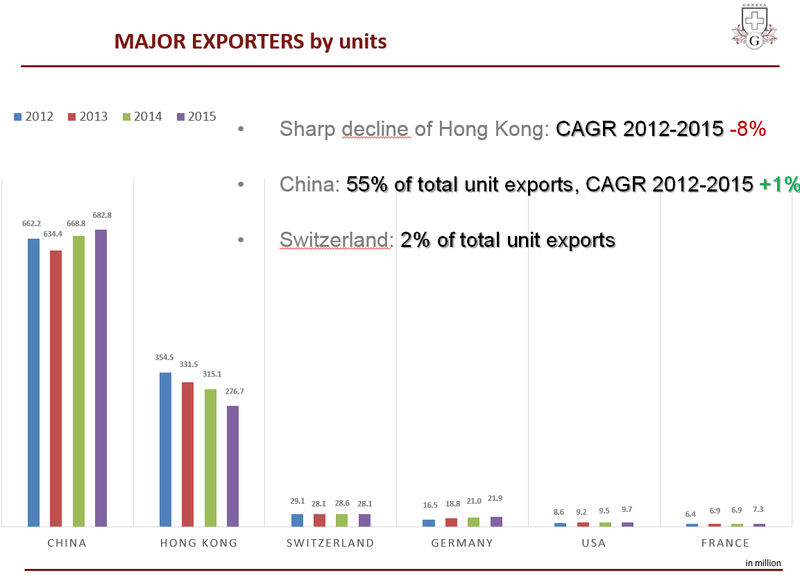 It’s no wonder the Swiss today export close to $22BLn worth of luxury time pieces a year. It’s also evident that nations who are finding new sources of wealth want to express it through high end watches. For men today, at least in the West, it can be argued it’s one of the only pieces of jewelry they can wear. That being said, today’s market for watches is as complex as the concept of time itself. A large market (world production stands at 1.2Bln units in 2015 with a global value of $50Bln), there is quite a bit differentiation between players. 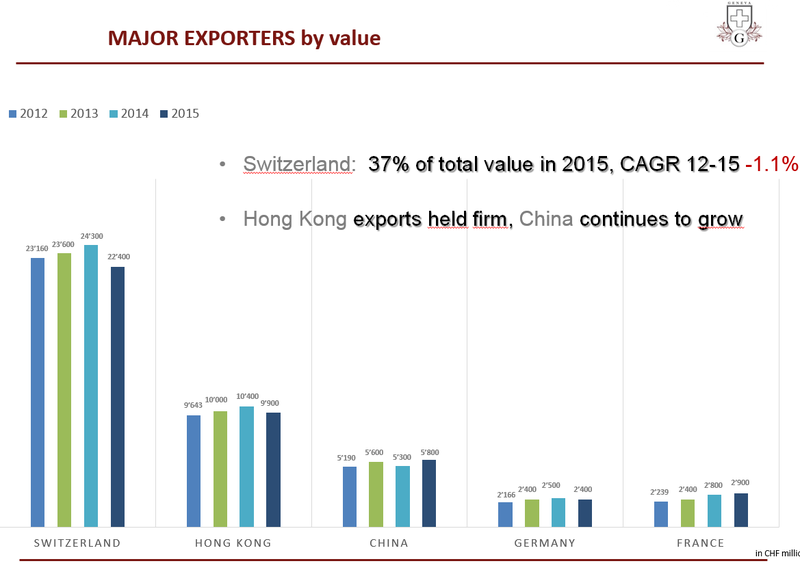 China for instance acts as 1st producer with 683MM units sold in 2015 but with Switzerland the 1st exporter in value with $22Bln in 2015. Anecdotally, the average price of a watch exported by China in 2015 is $4 whilst the average price of exported Swiss watches for the same year was $748. By revenue, Rolex is by far the world leader at CHF4.5Bln in 2015, 3 times larger than Omega the second in line. Cartier is third and among those three top brands, the average selling price is over CHF 5K. To the list of names in the affordable category, we now need to add the growing market for smartwatches. There were 79MM wearable devices (all categories of smartwatches) sold in 2015 which outsold Swiss watches in Q4 by 8.2MM units to 7.9MM. The average price of a smartwatch is $100-$800 impacting entry level players in the ‘conventional’ watch market the most. Apple is the leader in «Lifestyle» and even though they don’t break down their numbers our research seems to indicate that between 10-15mln of units were sold last year for $5-12Bln in revenues. Fitbit is the leader in «health» with 21mln of units sold for $1.8Bln. We assess the market can grow by +40% in 2016 and +20% in CAGR expected until 2020. Due to all the varying elements mentioned above, there’s been quite a bit of disparity within the group as relates to individual stock performance. Timex, headquartered in India, was up 178% last year, whilst Richemont and Swatch were down 19% and 21% respectively. 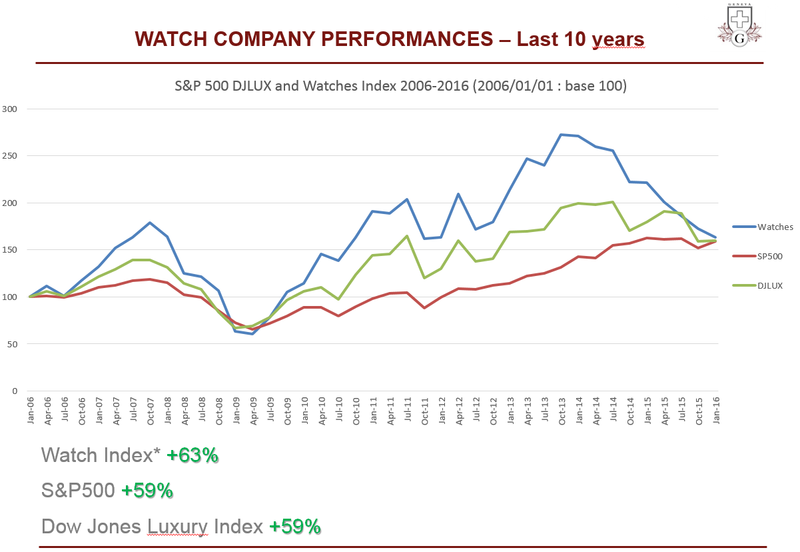 Over the past 10 years an equal weighted index of watch company equities slightly outperformed the S&P 500 (63% vs 59%) but this doesn’t tell the full story… there have been periods of marked underperformance as well as outperformance. PEs for sector stand at a 2% premium to the MSCI World but historically have commanded a 20% premium. Only once did the index fall below the S&P and that was during the Sep ’08 to Jan ’09. The main period of underperformance started in 2013 and was triggered by the Chinese premier XI Jinping’s drive against corruption. As ostentations signs of wealth had to be curbed by the Chinese elite overall, sales in China slumped leading to marked underperformance of the sector. At present we feel this information is fully discounted in the stocks and we can expect a period where EPS for watch makers, especially for products between $1K and $5K to start picking up. Franck Muller’s data and surveys show that even though Hong Kong is a ‘nightmare’ for watchmakers and the US is still in decline, but the average unit price is higher in the States. Again, even though entry level products are impacted by smartwatches and ‘absolute luxury’ is facing tough times, sales of products between $1K and $5K were resilient in Q1 2016. In Europe, Franck Muller see a mixed picture with the UK continuing to outperform but with Belgium and Switzerland still facing difficulties… Japan experienced lower growth than in 2015 (but on tough comparisons) and Canada remains robust. In parallel, Swiss Watch Exports data showed solid growth in Europe with Germany the best performer followed by the UK. To conclude, it appears to us high-end luxury companies are less innovative and over exposed to Asia which remains a problem. On the other hand, accessible luxury will be the winner as much more dynamic than the rest (TAG, Movado). Entry-level companies have diversified in smartwatches but they need to gain more credibility as it’s not their core business and face challenges to work with new partners (Intel, HP, Google). Smartwatches will grow fast (there are few new players) especially for «Lifestyle» SKUs. By way of names we like, in the US, there’s Movado thanks to their smartwatch offering and their diversified entry-level license business. We’re concerned with Fossil though, with a concentrated license business (MK, EA) and deteriorating margins. In Europe, we like Richemont thanks to their diversified watch portfolio (from accessible to absolute luxury) and their strong euro-based jewelry business. 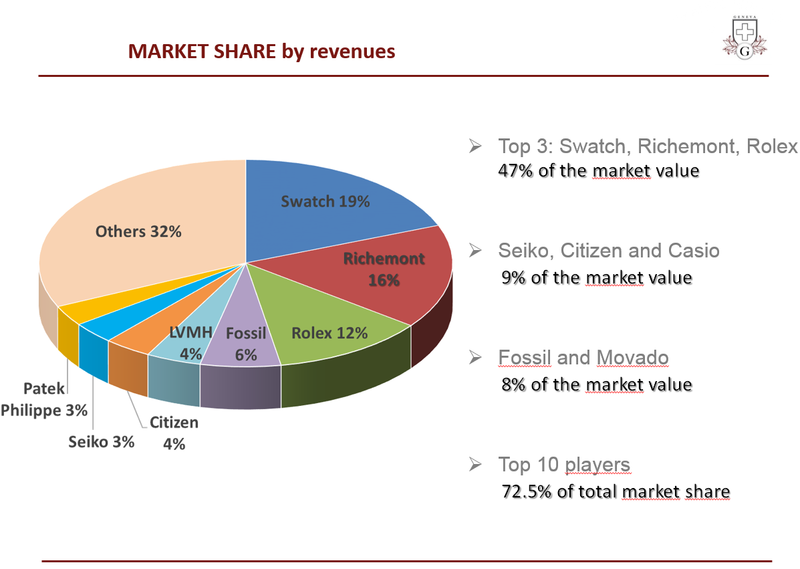 We’re extremely cautious on Swatch due to high exposure to the Swiss franc and new competition from smartwatches. In Asia, we like Citizen as it benefits from Chinese tourism in Japan and high rate of ‘newness’. We would also avoid hard luxury distributor, Emperor Watch & Jewelry, as wealthy Chinese consumers shun Hong Kong. *To tap into this theme as well as help our clients gain exposure to the global luxury sector, Notz Stucki and luxury watch maker Franck Muller have entered into an association and launched a Luxury goods equity fund, the “DGC – Franck Muller Luxury Fund“. The main impetus is to focus on companies with strong brands that have the ability to protect their margins through pricing power… a proposition that makes much more sense in our view in a deflationary environment. Please feel free to contact us if you have any questions regarding the fund or the above.